Pressure Sensitive Tapes - John Romanowski & Assoc., Inc.
John Romanowski & Assoc., Inc. Specialized PSA Tapes for your application. Do you have a unique need for a pressure sensitive tape? We can help! We have developed a number of specialty adhesives and substrates for customers to meet their special needs. Some products have gone into industrial converting, chemical protection, packaging, and manufacturing processes. Custom shaped and sized die cutting is available as well. 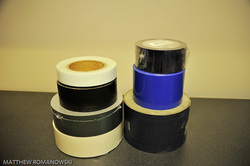 We can also provide tape products in strip form with sliced backing to make application easier. Circles, squares, rectangles, and all other shapes are available. Your imagination and needs are the only milts. Feel free to call us to discuss your application and needs. We will be able to help you out.